Our ace tech Jeremy looks on after installing a TC-B2 on a Cat318. The site required rock removal but without the heavy vibration that either a hammer or drill/blast would create. Without trying to sound overly dramatic or sensationalistic, there is a significant problem with the current state of infrastructure, particularly the condition of bridges, in the country. You know you have a problem on your hands when the most accurate phrase uses to describe your bridges are “functionally obsolete” and “structurally deficient”. Those descriptions apply to one out of every four bridges in the country. The age of the average bridge is currently 42 years. It is estimated that more than 30% of bridges in existence have already passed their 50-year design life, creating a backlog of repair and replacement projects that is currently being unmet. According to the Federal Highway Administration (FHWA), we are currently spending $12.8 billion annually to address the backlog. This is only a fraction of the funds needed to put a dent in the problem. To fully address the problem and eliminate deficient bridges, we need to bump that funding up to $20.5 billion annually. At that rate of spending $8 billion more annually, it would still take until 2028 for every bridge to be brought up to ideal operating conditions. Unfortunately, not only do we need to find ways to funnel more funding into infrastructure, the funding that is currently being allocated is in jeopardy of disappearing. As the Highway Trust Fund borders on the brink of collapsing, Congress contemplates a temporary measure to stave-off insolvency until next May. Temporary measures of this nature are not sufficient solutions. They allow for band-aids to be placed on major issues, but without securing long-term funding, there can be no long-term strategy for improving the situation in the future, instead of just preventing it from getting worse. To draw attention to the issue Department of Transportation Secretary Anthony Foxx and 11 of his predecessors penned an open letter to Congress this week. These 12 men have served both Republicans and Democrats and bring over 35 years of experience to the table. So when they say "Never in our nation's history has America's transportation system been on a more unsustainable course. ", it can be safely assumed that they aren't using hyperbole. While Congress works on securing the $140 billion necessary to complete these bridge repairs, others work on trying to prevent tragedies like the 2007 collapse of the Interstate 35W bridge in Minneapolis. States like South Carolina, Pennsylvania, Massachusetts, and New York are a few of the states that have began relying more on wireless sensors to receive up-to-date information on bridges to help them prioritize which bridges need immediate attention. The benefits of these sensors include relevant time-sensitive information and higher reliability than visual inspections. A team of researchers from North Carolina State University and the University of Eastern Finland have developed another product that might help monitor vital bridge information. The product is a new paint-on "sensing skin" that can be applied to concrete structures to detect weaknesses. 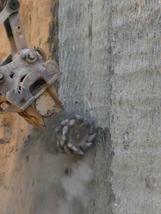 This low-cost option uses electrodes and a small electric current to run through the paint to pinpoint weakness in the structural integrity of the concrete before they spread to dangerous levels. The product is still in the testing stages, but advances like this one in monitoring bridge conditions will be necessary until we begin to invest the money to change the way we describe our bridges. Descriptions that don't include the words "functionally obsolete" or "structurally deficient". Any time a company boasts a new technology they are sure to draw attention. Whether they hold that attention is up to them. The way the rest of the industry responds after the initial excitement of the announcement subsides reveals whether their innovation was just a gimmick, a short-lasting fad, or an industry-elevating leap into the future. Kite Bricks is hoping that their newest development falls into the latter category. In a story that caught the attention of trusted sources like Wired and Equipment World, Kite Bricks announced their intention to re-think vertical construction from the ground up. The Smart Brick (S-Brick), is an all-new Lego-like brick that is expertly designed to connect with each other while leaving internal space available for insulation, plumbing, and any other pipes and wires that need to be installed. While they may resemble brittle, plastic Lego blocks, the S-Bricks are incredibly durable. Materially, the brick consists of a high-strength concrete that will keep the buildings structurally sound against even the worst weather elements. In theory, which is where the project remains currently, awaiting patent approval and an additional $3 million in funding to bring the prototype to market, the S-Brick solves a wide array of problems for construction companies. The bricks come in a variety of shapes and sizes, allowing a precise amount of material to be ordered for the job. 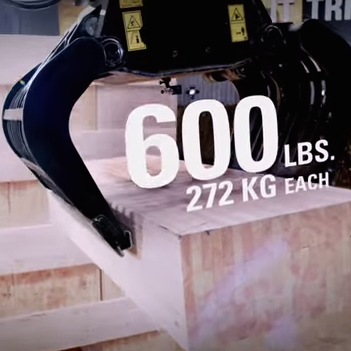 This eliminates excess material from being put in buildings because it was cheaper than buying custom parts. The brick system also simplifies construction and requires no additional finishing. With S-Bricks, many aspects of a traditional building site would no longer be required to finish the job. From cranes and scaffolding down to building-sand and mortaring, several steps will be removed from the construction process significantly reducing cost and improving efficiency at the work site. The company claims that as much as 50% of the building costs can be eliminated by using S-Bricks. Further benefits can be found in the form of less construction time and a much cleaner, quieter and safer work site. With less clutter in the work space, there will be less noise intruding on the surrounding areas and allow for work to be completed cheaper and more precisely. The benefits would ultimately be passed on to the end consumers and environment, as the main catalyst behind coming up with the bricks were to find an energy efficient solution to building houses. The S-Brick’s thermal properties and the internal space that is left for infrastructure elements will drastically reduce the cost of heating and cooling the unit. The ability to control energy output with greater precision will save money and reduce the amount of energy that is used. The team at Kite Bricks have a big vision for their new project and hope to see it take-off not only domestically, but also around the globe, where the S-Brick’s ability to be constructed from a wide range of materials might make it appealing to poorer countries with less resources to invest in infrastructure. In a time where infrastructure-boosting energy-friendly solutions are necessary, companies like Kite Brick are experimenting and innovating to find industry-changing solutions. When change comes to the construction industry, not even the common brick is safe. 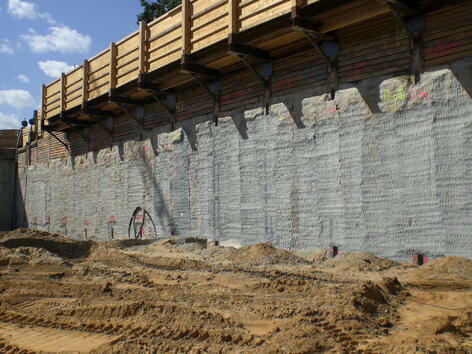 Caisson walls are composed of vertically drilled, intersecting reinforced concrete piles constructed for ground support during excavation and construction activities, especially in urban areas where work is being done close to existing structures. The resulting vertical face is a series of rounded humps which often must be ground smooth for the next phase of the job. Alpine’s hydraulic rotary concrete grinding attachment (RockWheel series) is an ideal tool for rapid and precise concrete trimming. The continuous milling action of the carbide tipped cutting drums leaves a smooth surface and cuts with minimal vibrations so the remaining concrete is not damaged. Optional depth control guides allow for milling the concrete to a set depth which removes variability in the finished product. Additionally, a water spray system can be added to minimize dust and cool the cutting teeth which extends longevity. Available in a range of sizes to suit any excavator (or skid steers and backhoes) there is an Alpine RockWheel suitable for your job. An article in the economist last week explored some of the reasons behind America’s crumbling infrastructure problem. The article mentioned the Pulaski Skyway, a bridge that New Jersey Governor Chris Cristie is currently under investigation for by Securities and Exchange Commission, as well as New York’s District Attorney because of the methods he used to try and find for repairs. While mentioning the Pulaski Skyway, the article could have used hundreds of other bridges to demonstrate the failing infrastructure that is in desperate need of repair leaving officials at the state and national level reaching for solutions. The problem isn’t necessarily with the structures' design, but with a lack of assets necessary to maintain proper upkeep. The country has seen two major periods of infrastructure spending that has led to this situation. The first was in the middle of the Great Depression and the second came during the 1950s and 1960s. The structures that were built during these eras, some of which are magnificent pieces of engineering, were not made to last forever. Many of them were built to last about 50 years. 50 years of pushing off repairs until later has resulted in many projects failing at the same time. This has led to two major problems. First, any core pieces of infrastructure, including highways and bridges, are in desperate need of repair and there are insufficient funds at the federal level to fund the construction projects. The second problem is that not enough money is being invested in creating new infrastructure. The majority of the country’s infrastructure is some combination of outdated, broken down, and inefficient, even when fully functional. For an example the article points to the poor condition of American airports. Another area that is extremely underfunded, airports have not been able to keep up maintenance to match the increased air traffic that has occurred over the years. This is noticeable in every asset of the airport, from parking to wading through customs. Even the hangars are not large enough to accommodate size of standard airplanes, which has damaged many wings in the process. Air-traffic controllers use equipment that is less sophisticated than what is found in the average smart phone. These problems demonstrate the need for a new importance to be place on improving the infrastructure in the country. With serious improvements a necessity--no longer an issue that can be pushed down the road--the article ends with a couple places decision-makers can look to improve the situation. The first suggestion is the hope that state and federal government officials realize the need for immediate action. One option is currently languishing in Congress, a bill sponsored by John Delaney, a congressman from Maryland, that has bilateral support and proposes to give firms a tax break on repatriated foreign profits if part of the money brought back was spent on infrastructure bonds. This would give companies an added incentive to return their profits to domestic markets at a lower tax rate, and bring some much needed capital to rebuilding infrastructure. Another idea that was suggested is to follow the European model and bring in private money to compensate for the lower level of public investment. Securing the right public-private partnerships could be a big step in the right direction for a country whose infrastructure is in serious need of an overhaul. The key decisions that will be made in the next few months will dramatically impact the country's construction outlook. Whatever happens, this is no longer an issue that can be ignored. 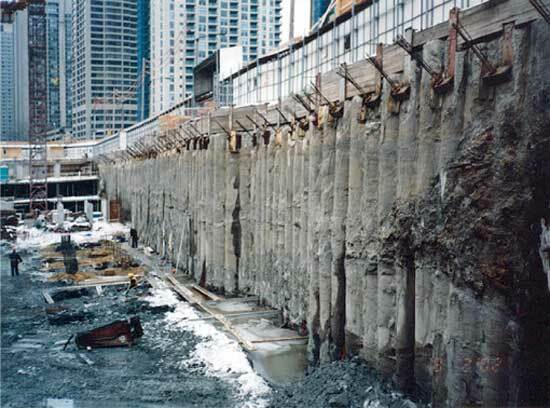 Excavation and tunneling projects are nuanced and complex. The amount of planning and technical execution that goes into ensuring the job is completed successfully is significant. 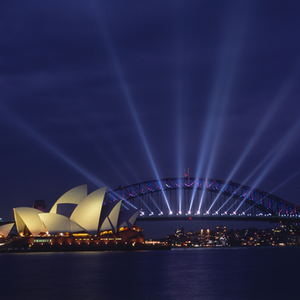 Nowhere are these projects more challenging though then when they take place in urban settings. 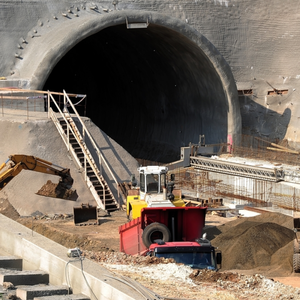 When these major excavation and tunneling projects take place in urban environments, it is not only a priority to create the tunnel, but also to excavate in a way that does not cause distress or deformation to the surrounding infrastructure. University of Cambridge engineers are taking advantage of a unique opportunity in London to answer a lot of questions about how large-scale excavation impacts cast iron tunnels. The project underway is a Crossrail platform tunnel that is almost 11 meters in diameter. The new tunnel runs parallel to an old cast iron tunnel, the Royal Mail tunnel, which was employed to transport mail from 1927 until 2003, for a long stretch. Research engineers are taking this opportunity to use sensor technology that has been widely in the lab to monitor how excavation on the new tunnel is impacting the existing infrastructure. To receive accurate and detailed information, hundreds of low-cost sensors were installed in the Royal Mail tunnel. There are several different types of sensors that are located throughout the tunnel. Optical fiber sensors are used to monitor the strain longitudinally all the way along the Royal Mail tunnel to capture how the tunnel deforms and bends. Wireless displacement transducers were placed along the railway to measure displacement from one part of the tunnel in relation to other parts of the tunnel. As it receives information, it is able to send and that on wirelessly to a receiving station. The sensors provide incredibly accurate information and are claimed to be able to detect displacement as minimal as one-hundredth of a millimeter. Other sensors provide information on temperature, humidity, and acceleration to understand what conditions are like inside the tunnel. Advanced computer vision techniques are also being implemented to monitor the project. Collectively, the sensors are providing an extremely accurate portrayal of how the Royal Mail tunnel is responding to the construction work going on around it. With this wealth of instantaneous information, the Crossrail engineers are able to diagnose potential issues and make the necessary adjustments to protect the historic piece of architecture before any serious damage occurs. 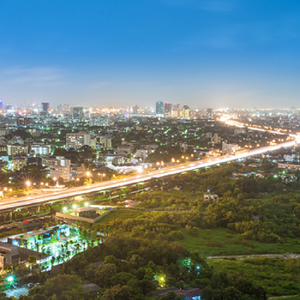 The value these types of sensors provide will not only be beneficial to this project, but could also prove to be very useful to other projects in urban areas moving forward across the globe. The ability to pinpoint how the construction affects cast iron structures will be especially beneficial to any future projects that take place in the London Underground. 70% of the London Underground consists of cast iron. This inaugural “smart” tunnel has already returned exciting results for the Cambridge team. It will be interesting to see where this cutting edge technology goes from here in the future of excavation projects. The cement industry felt its landscape shift on April 4, 2014 when major companies Holcim and Lafarge announced their plan for a $50 billion merger. The new company will be called Holcim-Lafarge and set up their headquarters in Switzerland, but will also be listed in both Zurich and Paris. The merger will be positioned as a merger of equals. There will be no cash outflow at all in the deal with everything taking place through stock. Every Lafarge shareholder will receive one Holcim share for every Lafarge share they own, and Holcim shareholders will own 53% of the group. The merging groups believe their cooperation to be strong synergistic move that will make them more flexible to meet market demands in an efficient manner. They expect to save close to $2 billion in their operating costs by becoming more efficient and shaving costs. The two competing companies will now combine to form a global presence that reaches into 90 countries and consists of over 136,000 employees. The merger announcement came on the heels of just under three months of negotiations. If the merger is approved, it would have a dramatic influence on the future of cement production and fundamentally transform the industry. The impact of this unprecedented merger will impact not only the cement industry, but also related industries along the supply chain such as aggregate production and the ready mix materials. To comply with the necessary requirements for an approved merger, the companies will have to divest 10-15% of their assets. Holcim-Lafarge plan to address at least 15 competition authorities worldwide. The company not only faces the complication of having to sell off assets, but also needing to be selective about who acquires those assets. Since the market is so concentrated, there will be significant interest over how the assets are split up among interested investors. The plan is for most of the divestment to involve European assets where the companies experience the majority of their overlap. The companies promised to sell assets that create €5 billion, or $6.8 billion, revenue annually in an attempt to appease anti-trust concerns. To handle selling off the large amount of assets, Holcim-Lafarge is creating a divestment committee to handle the interest from potential investors. In addition to selling off assets and making sure they go to appropriate investors to maintain competitive balance, the European Commission already has an investigation open against, Holcim, Lafarge, and 6 other companies over allegations that they operated as a cartel in the cement and cement-based products market. The investigation officially opened in 2010 and the risk of heavy fines will surely scare away some potential investors. The size and complexity of this deal, along with the cartel allegations, means it will be a lengthy process to see if the merger is approved. Right now, the projection is that the merger will be finalized in early 2015. The movements that take place over the ensuing months will have a distinct impact on the many different construction industries that use or are related to cement products. 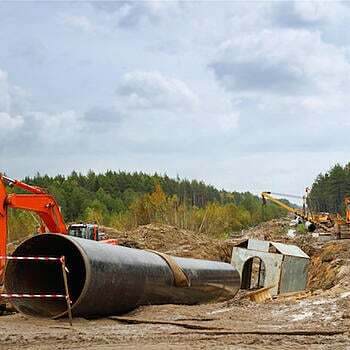 In an effort to diversify their exportation of oil sands production to Asian markets, Canada’s government approved the construction of 731 miles of new pipeline. The Northern Gateway project would have the capacity to transport 525,000 barrels of crude oil sands a day to Asia-bound tankers. The pipeline has wide support from the oil companies because it would allow for the unrefined oil to be transported much more safely and cost efficiently than shipping it by rail. The government is also enticed by the economic benefit that project would create. Additionally, the project would create 3,000 new construction jobs to build the pipeline. Approval for the pipeline was given conditionally, with over 200 terms the pipeline’s owner, Enbridge, need to comply with before moving ahead with the project. Construction is not expected to start before 2017. Many would rather see it not start at all. The Northern Gateway project faces heavy opposition from environmental groups and scientists who believe the pipeline will do irreparable damage to ecosystems and the environment. The pipeline would also cut through territory that is populated by First Nations groups which have never signed treaties with the government. These complications make moving forward with the project a delicate exercise. Some see this as a move by Prime Minister Stephen Harper to try and motivate United States President Barack Obama to finally make a decision on the Keystone XL pipeline project that would go through parts of Montana, North Dakota, South Dakota, and Nebraska before connecting to existing pipelines. The proposed project would carry the same crude oil, mostly bitumen, down from Canada to oil refineries along the Gulf of Mexico. It would also transport some domestically produced crude oil from South Dakota as well. The necessary pipeline would require 875 miles of new 36-inch-diameter pipeline and related facilities. The project would create thousands of temporary construction jobs to take care of the surveying, clearing, grading and trenching involved in laying the pipeline, as well as the numerous ancillary facilities that would be required to operate the pipeline. The approval of the Northern Gateway project has already caught attention in the United States. In response to the news about the Northern Gateway project, one U.S. senate subcommittee passed a vote 12-10 to approve the Keystone pipeline, but it remains unlikely that Senate majority leader Harry Reid will bring the bill to the floor for a full vote. Because both projects face such staunch and vocal opposition, it remains to be seen whether any actual action will result from the announcement. 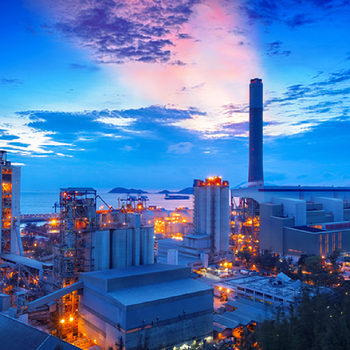 The potential implications on the energy sector and the accompanying construction projects that would be required to complete them could be significant. If any trenching does take place, we’ll have some Alpine Cutterheads ready for service. As construction companies face the reality of an aging workforce and the difficulty of finding young skilled workers, they also face the task of changing the public perception of the industry. The German Engineering Foundation, VDMA, is a good example of taking a proactive approach to adjusting perception at the Bauma 2013 conference in Munich with their Think Big campaign. The focus was less on directly recruiting young people into vocational fields, and more about showing them how the industry has developed and the advanced technology that has changed the landscape of the day-to-day construction career. Another company that is doing a great job of demonstrating usefulness and creativity is Caterpillar. Caterpillar made waves last month when they released a video that went viral of five of their machines playing the world’s largest game of Jenga. They were at it again recently, releasing this clip of an operator expertly maneuvering a 301.7 CR mini excavator around a China shop that Caterpillar created special for the video. Equipment world called the video one of the most impressive displays of operator skill they’ve seen. The video lasts less than two minutes and shows Ryan Neal, a senior demonstrator instructor at Cat, carefully using the bucket of the machine to transfer a glass onto the top of a pyramid champagne of glasses. This type of video is a great way to demonstrate both the unique experience of operating this type of equipment and also the extreme functionality that the equipment can provide their customers. While it is doubtful that many construction companies will be erecting champagne pyramids, excavation projects or trenching around utilities in urban areas are both situations where precision and control are premium qualities. In addition to demonstrating the valuable qualities of the machine, the video also conveys the many advantages there are to devoting sufficient time to train your workers on these advanced machines so they have the ability to operate them as efficiently as possible. Investing in your employees training will make advanced machinery even more beneficial to your company and you will run more efficiently than ever. If you are about to start a job that requires precision and control, a mini excavator could be a great piece of equipment. 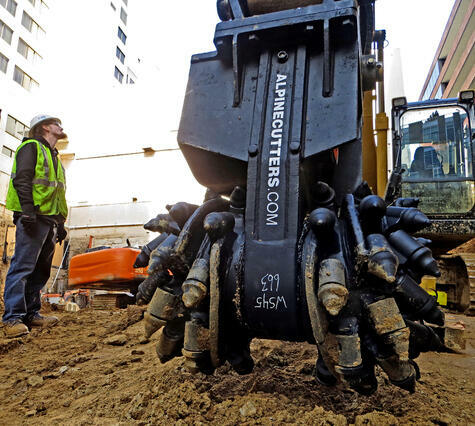 If your next project involves trenching, tunneling, or excavating our wide selection of cutterhead attachments could provide you with even more control over your operation. The more control you have, the more confident you can be in the results you expect to produce. New construction starts rose for the second month in a row in April. 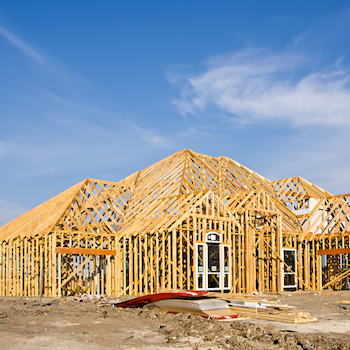 The April construction outlook brings good news to a sector that suffered from a brutal winter with unusually tough conditions. With the strong rise preceding the summer months, companies are confident that the new projects will make up for a remarkably slow start in 2014. The April data doesn’t provide any type of conclusive forecast for the rest of the year, but the positive month is a good sign for the construction industry and if coupled with a positive May, gives reason for optimism heading into the summer months. 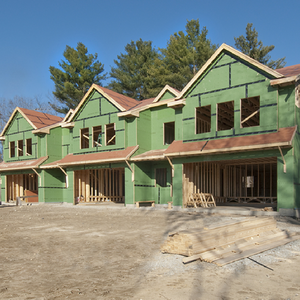 Robert A. Murrary, chief economist for Mcgraw Hill Construction summarized the April data with this evenhanded outlook. “On the plus side, nonresidential building is strengthening once again, after slipping in recent months. The commercial and manufacturing categories are regaining momentum, while institutional building is making the transition to an up-and-down pattern after its steady decline over the past five years. Multifamily housing continues to move at a good clip. The increased workload had a positive impact on job rates country wide as construction employment outlooks continued to brighten. Overall, April jobless rate fell to 9.4% from March’s 11.3% and the workforce increased by roughly 32,000 jobs. The regional outlook varied with some states experiencing larger growth, while some state’s like Minnesota had a disappointing month overall. The drop in jobless rate to 9.4% was a welcome well though. According to the Bureau of Labor Statistics monthly employment report, which was released back on May 2, construction’s unemployment rate last month was much better than it was in April 2013 where it sat at a level of 13.2%. The bureau’s report stated that April's construction-jobs growth spanned all industry sectors, led by buildings construction, which gained 11,000. In April new starts increased for nonresidential building and housing. Construction on public works, electric utilities, highway work, and bridge construction all fell. We’ll continue to monitor which type of construction projects are on the rise and which projects experience a dip in production.